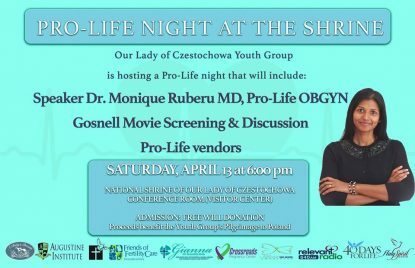 Join us for a Pro-Life Night Shrine of Our Lady of Czestochowa, Doylestown, PA on Saturday, April 13 at 6:00 pm in the Conference Room (Visitor Center). This event will include: Speaker Dr. Monique Ruberu MD – Pro-Life OBGYN, “Gosnell” Movie Screening & Discussion, prayer, and many pro-life vendors. This is a free event. Free will donations are appreciated, and all proceeds will benefit the Poland Pilgrimage of the Youth Group.